Corpolatin is Colombia’s most-used children’s helpline. This free service offers immediate crisis support, as well as follow up support. 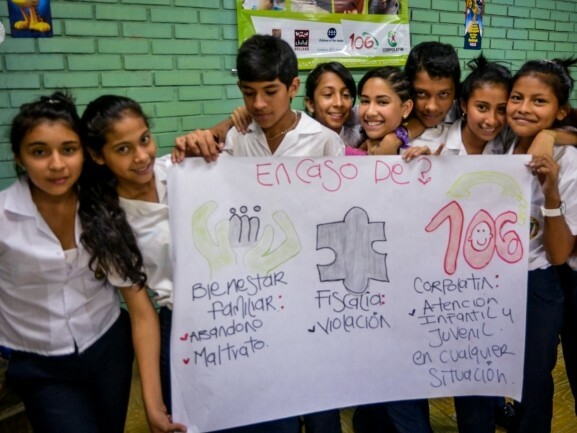 Provides training for at-risk children to recognize/resolve conflict & risky situations. Works with parents, carers & teachers helping to protect children from abuse. Helps enable better coordination between child protection institutions. Corpolatin runs Colombia’s most-used children’s helpline. As well as offering immediate crisis support, the line helps put children and their families in touch with the services they need and offers follow-up support. Corpolatin offers more intensive support to at risk children, providing training to help them to develop the skills to resolve conflict and deal with risky situations. They are taught to recognise what constitutes abuse and violence, what situations increase their risk of this, and how they can protect themselves from abuse or risk situations. Corpolatin also works with parents, carers and teachers, helping them to learn about domestic violence and child abuse, how to detect it is happening or signs that a child is at risk, and how to protect children from abuse. Corpolatin also works to enable better coordination between child protection institutions.